When we move somewhere or buy new furniture, we usually order a special moving service or just ask someone for a help. It seems to be very easy to move heavy items with the help of moving services or just together with your friends. But still, what to do if you do not have an opportunity to order such a service or ask somebody for a help? So, in this article, we are going to look through the main tips to move furniture upstairs by yourself. First of all, you need to measure all the furniture you are going to move upstairs. This will help you understand and decide how it will be better to move it. For example, if it is a high wardrobe, it will be better to cant it and move in this position. In another way, it may not enter the doors, etc. In fact, the furniture can be too heavy and can contain several parts. For some people, it is even impossible to lift it at all. That is why it is important to remove all the attached parts. In such a way, we decrease the size and weight of your furniture. After that, it will be easier to move it upstairs. Basically, moving furniture upstairs is not an easy process. Everything can happen. That is why it is very important to pack everything in special packing paper. Of course, it will be easier to order sfmoving.com, as these guys know what to do with your furniture. By the way, you can read more information about this moving service on the following link http://www.sfmoving.com. In any way, just pack everything to avoid all the possible damages while moving your furniture upstairs. Nowadays, you can find out various moving equipment, which can make the process faster and easier. You may have heard about such things as trolleys, sliders, and rollers. If not, just google it. Actually, to move a huge wardrobe or a heavy bed is not an easy thing. Moreover, if you try to move it without special equipment, you can damage the furniture surface or even your back. So, find out this equipment in the stores or just rent it, and the process will be faster, safety, and easier. 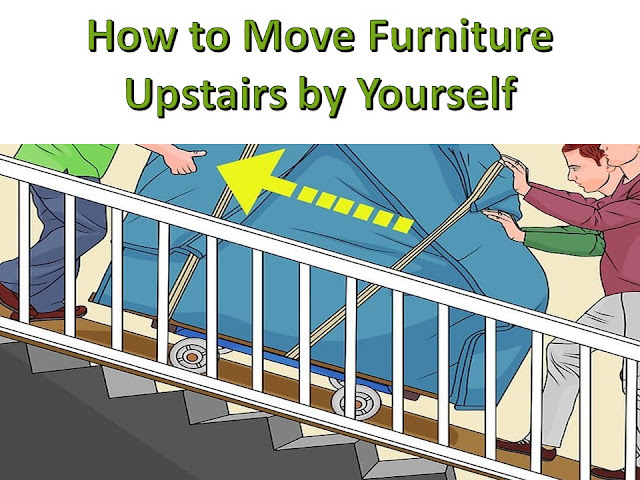 However, this is the most inexpensive way to move your furniture upstairs by yourself. Just take an old sheet, rug or cardboard and put it beneath your furniture. After that, try to move your furniture. So, now you know the main tips to move your furniture upstairs by yourself. Just follow the rules, and the process will be faster, safety, and easier. Nevertheless, if you have some health problems, it will be better to order a special moving service such as sfmoving.com, etc.